Renold has extensive experience in supplying theme parks around the world with conveyor chain for theme park rides, from roller coasters to water rides. Through continuous research and development and examining the common causes of chain failure in corrosive environments, Renold has developed the Trident Chain series to tackle the three main areas of failure in such environments: corrosion, seizure and wear. Due to constant exposure to water, corrosion is often an issue on water ride chains. 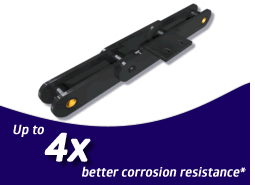 To address this, Renold has developed a dual process surface treatment to increase corrosion resistance. The zinc based specialised coating offers superior protection of the steel. Even when the coating is penetrated, the treatment continues to offer superior corrosion resistance. Transfer and lift chain on rides can suffer from seizure of the bush and pin and significantly shorten the life of the chain. Through the development of a unique polymer sleeve, metal-to-metal contact is reduced, thereby eliminating the risk of the bush and pin seizure. 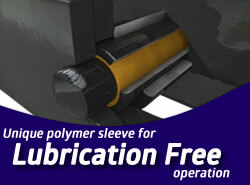 This also provides lubrication-free operation and removes the need for any lubrication ports. Development of a heavy wall bush design overcomes premature wear and failure of the bush, and in most cases a shell roller can also be incorporated which reduces wear on sprocket teeth; increasing life of both the sprocket and chain – and reducing maintenance time and cost. Operates on the same sprockets and track as standard chain. For more information on Renold Trident and how it can reduce costs for your theme park rides, call us today on +91 9047777535 / 540 or use fill in our request form for more information. 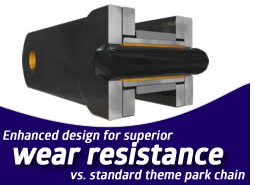 Renold Is the Leading Manufacturer/Supplier to All Major Theme Parks and Theme Park OEMs.